NEW Price Change! Upscale Lakefront Home Grabs Your Attention with its Ultra Clean Style and Professionally Landscaped Yard. 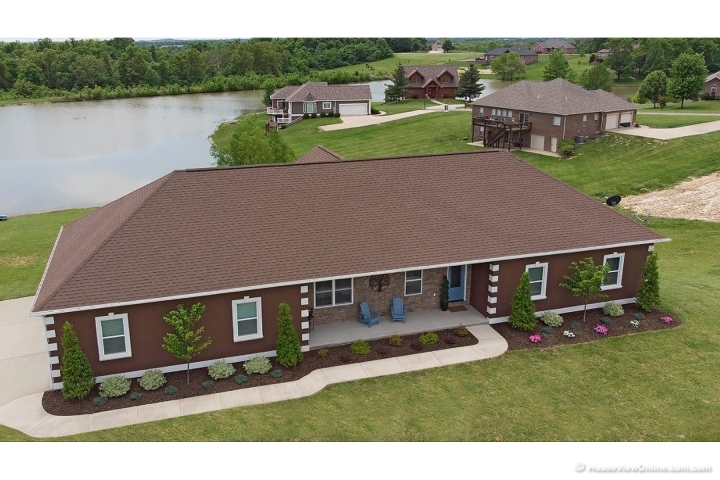 5BR/3BA/3GA with Fully Finished Walkout Lower Level,Vinyl Fencing,Bordering an 8 Acre Stocked Lake. Vaulted Ceilings in the Living/Kitchen/Dining & 10' Ceilings thru-out Main Level give this Home an Open & Inviting Feel. Modern Kitchen with Stainless Appliances, Concrete Counters, & Walk In Pantry flow to the Formal Dining-Perfect for Entertaining! Additional Features: New Wood Flooring thru-out Main Level, New Interior Paint, Crown Molding, & Covered Deck (No Maintenance, Composite Decking) Luxurious Master Suite with Crown Molding, Large Walk In Closet, Spacious Bathroom with Jetted Tub & Custom Tiled Shower. Lower Level Features: 2BR/1BA, +Office. Built In Entertainment Center, WetBar, Pool Table, and Lake Views from Every Window (pool table & 1 massage chair remain) Garage is 33X31 w/ 11 ft ceilings. ENERGY EFFICIENT GEOTHERMAL HEATING/COOLING SYSTEM...LOW UTILITIES!